President Moon Jae-in flew to Singapore on Tuesday, ahead of summit meetings with the leaders of Brunei, Laos and Russia the following day. According to Seoul’s presidential office, Moon will meet with Sultan of Brunei Haji Hassanal Bolkiah, Laotian Prime Minister Thongloun Sisoulith, and Russian President Vladimir Putin, on the sidelines of ASEAN and East Asia Summit events. Moon is in Singapore on a four-day visit to attend a series of multinational summits, and will move on to Papua New Guinea on Friday, where he will attend events related to the Asia-Pacific Economic Cooperation. In addition, Moon is also scheduled to meet with Australian Prime Minister Scott Morrison during the trip. Seoul is also in the process of arranging a summit with Chinese President Xi Jinping and a meeting between Moon and US Vice President Mike Pence. 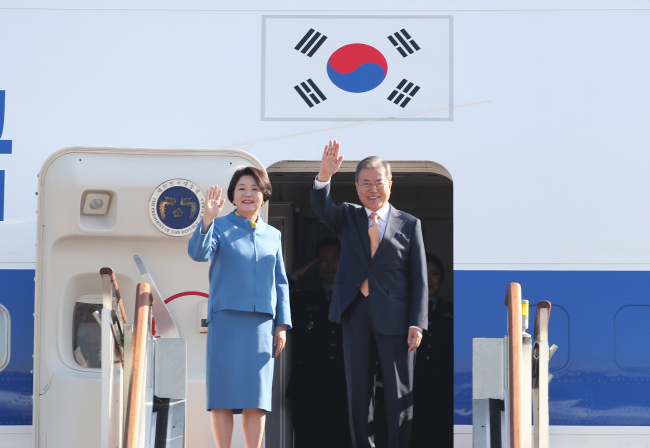 On the first leg of the trip, Moon will attend the Korea-ASEAN Summit, the ASEAN Plus Three Summit, and the East Asia Summit meetings. On Thursday, Moon will attend a summit of countries negotiating the Regional Comprehensive Economic Parnership, a free trade deal among 10 member states of ASEAN and Korea, Australia, China, India, Japan and New Zealand. The 10 ASEAN members are Brunei, Cambodia, Indonesia, Laos, Malaysia, Myanmar, the Philippines, Singapore, Thailand and Vietnam. “At the ASEAN summits, (Moon) will discuss ways to expand and strengthen cooperation with ASEAN, which is one of the main partners in the government’s New Southern Policy,” Nam Gwan-pyo, deputy chief of the National Security Office said at a briefing last week. The New Southern Policy is one of Moon administration’s main foreign policy objectives that seeks to establish stronger political and economic ties with countries to the south and southeast of the Korean Peninsula. Nam also said that Moon will brief the attending leaders on his administration’s push for establishing peace on the Korean Peninsula. In Papua New Guinea, Moon will pitch his vision of “innovative inclusive nation,” seek ways to cooperate in the development of the Asia-Pacific region, and meet with members of the APEC Business Advisory Council, Cheong Wa Dae officials said.